Our Children Need to be Saved from HUNGER!! What can I say? This is a special issue, dedicated to the nutritional needs of mothers and children, one of two, sponsored by GAIN (Global Alliance for Improved Nutrition) under their Programme on Infant and Young Child Nutrition. The pictures below tell only a small bit of the story, but quite a bit. 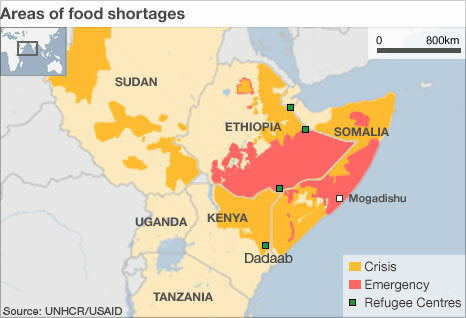 The Horn of Africa (Kenya, Ethiopia and Somalia), and beyond (countries in yellow) is facing its worst famine in 60 years, with over 10.5 million people facing starvation. From information available to us locally, there already have been deaths of vulnerable groups (children and old people). It is difficult to get accurate data as officials are too embarrassed to admit that millions of their citizens are actually facing starvation, and that millions of children are going hungry, as many die. One of the disturbing realizations is that this catastrophe was predicted by credible organizations such as the Kenya Red Cross, who made the information available to the relevant authorities. In 2009, Kenya had another very severe famine due to drought, and at that time, close to ten million people faced starvation. At the time, donor agencies were reluctant to come to Kenya’s aid as famine coincided with media reports of high level official corruption and misuse of public resources. 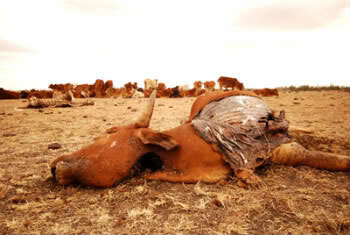 The drought then that sew livestock also die (a picture is below) was followed by killer floods into early 2010 that killed both humans and livestock as well. I wrote about all these events. It saddens me, but also embarrasses me to continue seeing these pictures of desperate hungry mothers and children, almost every other year. In 1995, I did some work for the Kenya Government on drought and refugees. The Horn of Africa was facing a major famine then, due to drought and Kenya, just like NOW was having to cope with droves of refugees moving across the border in search of food. At the time, the refugee numbers in Dadaab moved from a little over 300,000 to three quarter million. It was worse then, at least as far as numbers. Now, the Dadaab camp, built in 1994 to hold 90, 000, is being pushed to hold half million, and at a time when there are major security concerns, something the Kenya government does not take lightly (It has to protect its own people, who too are going hungry). Also following my report, which was shared with Government operatives in various workshops, a regional disaster management centre was formed, to deal mostly with security issues and small arms proliferation that arise from movement of hunger stricken refugees. I feel the regional centre was mandated to address the core of the refugee problem. Why do people move from the comfort of their homes? Why do people resort to banditry and other acts of violence? In the Horn of Africa, it is when they are threatened by lack f food, and lack of pasture for their animals. The droughts are predicted, and they are becoming more and more severe and catastrophic; climate change has always been a reality in this region and its negative impact can only get worse. Why has early warning information not been used all these years? From my readings and experience, drought does not have to turn into major famine; but it will if conditions exist that make it difficult to move food, for example insecurity. Kenya has lost lives to bandits and militia groups who cross the border to kill and steal animals. Kenya too has pirates operating off its coastline. In a region of insecurity such as this one, and then hit by drought almost every other year, famine catastrophes are inevitable. Long-term measures are required to deal with famines. Good governance is a must but then Somalia is a failed state with terrorist groups that target Kenya, and so the Kenya government is justified in demanding that the refugee population be shared with other countries around. Main countries hit now are Somalia, Kenya, Ethiopia and Uganda. With better governance now (Kenya’s new constitution) and commitment to make use of early warning information, surely Kenya should be able to prepare better for droughts, with a view to protecting its vulnerable population groups by avoiding famine. As I prepare this Editorial, I need not write more as I have just received a report on a Geneva- convened meeting of 1985 to discuss the Ethiopian Drought that was a really bad drought. Kenya’s award winning Mohamed Amin brought famine pictures to people’s home screens. The seven minute clip was shown around the world on October 24, 1984 on BBC and became an instant hit; it attracted world attention, resources and the Song “We are the World” by late Michael Jackson and his star colleagues. Mo (as he became fondly known) unfortunately and ironically died when a hijacked Ethiopian Airlines flight crashed off the Comoros Islands in the Indian Ocean, on November 23, 1996. Another irony was that he had lost his left arm in Ethiopia in 1991 when a rocket hit him during the ravage war that finally toppled the then government of Ethiopia. He is still remembered as the most celebrated Television reporter in Kenya, and one of the most fearless ones in the world, and even as the current famine rages in East Africa, the worst for Kenya in 60 years, our thoughts are cast back to what our own (Kenya’s) son did for Ethiopia back then, to his clip on BBC on October 24, 1984. The report of the workshop convened in Geneva was forwarded by Dr Jean F. Freymond, President of Network for Governance, Entrepreneurship & Development in Geneva, who is also Secretary of SAA. The late Ryoichi Sasakawa of Japan, together with the late Norman Borlaug, and former President of USA Jimmy Carter, together established Sasakawa Global 2000 in 1985, and Sasakawa Africa Association, whose Board of Trustees I am now honoured and humbled to chair. A summary of the deliberations of that workshop in Geneva in 1985 can be found here. Even then, in 1984/85, the famine was widespread, to more than 12 countries of the Horn of Africa; however, Ethiopia was the Epicenter then. This time, more countries than just Somalia are affected as an estimated 14 million adults and children face starvation. 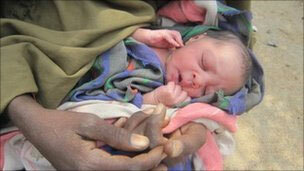 The pictures we see from BBC are of mostly women and children. We know everyone is affected including men, and this time in Kenya, men too have been reported to have died. As Kenyans watch TV clips of hungry emaciated children and men, we are horrified by the denial by the Government spokesman, who as late as August 1 this week was asking: “show me this week which Kenyan has starved to death?” Departed ones whose lives were touched by hunger must be turning hard in their graves. So what is the answer? The 1985 report I have referred to, makes it clear that it cannot just be drought only that leads to such famine catastrophes. The causes then in the report were described as “socio-political, multiple and complex..” and one wonders what would happen if the same were to occur in another part of the world? We can have organizations such as SAA working in 15 African countries ( now in 4) with smallholder farmers to try and get them out of abject poverty, the Bill and Melinda Gates Foundation helping to renew world interest in Agriculture and also financing many projects, International Fertilizer Development Center (IFDC) working to restore Africa’s soil fertility, European Union as a collective and member states individually helping to fund agricultural research, the CGIAR centers with funding from multiple partners including the World Bank working to find solutions to world food supply, small-population countries such as Australia renewing their interest in Africa’s agriculture, countries like the USA, Japan and others of the G8 Group with their own problems coming in to assist in various ways, and Africa’s own institutions such as AGRA and CAADP under NEPAD doing what they can. Let us ask ourselves: Is the Great Horn of Africa the only part of the world that experiences drought? It does not make sense that in 2011, the Horn of Africa has a worse famine than that experienced 25years. These are the big events that settle on the world media screen. In-between, there are drought and famine events too, although these may not be widespread or as severe. This region of the world is a perpetual recipient of food aid. While people face starvation in their millions, Kenyan politicians are loudly shouting against GMOs. First of all they do not understand the science, second, they do not go hungry themselves, third, they have no idea what hunger looks like, except when they see it on TV, and yet they purport to talk for the hungry poor. NOBODY is forcing them to eat genetically produced food, but I would urge them to find solutions to the perpetual and scandalous problem of hunger and starvation. The answers can only be found through support for Science and Technology and display of good governance. A leadership that does not respect its scientists, and support science and technology research and development, is a leadership that is wanting. In this day and age, in the 21st Century, no child should be going hungry; NO CHILD should be dying from malnutrition. We just have our priorities wrong! Our politicians are also already campaigning for elections which may come in 2013. I do not hear any of them use “ridding Kenya of the indignity of hunger” as a campaign platform. Let me pay tribute to the Global Alliance for Improved Nutrition (GAIN) for sponsoring this issue 45 of AJFAND. Let me thank all those who come to Africa’s aid to save our children when we are in dire straits, and let us honour all those who departed from us fighting to rid the world of the scourge called Hunger, and let me encourage all of us who get touched by the famine events to relentlessly look for solutions to this problem, as we are promised a better world when we do. And finally BRAVO to the private Kenyans, who have come out in full force to assist their fellow Kenyans, working with the Kenya Red Cross to do what they can. We are in this together, with everyone doing and being asked to do what he/she can.